International SAP Conference for Utilities – Register for Early Bird until Friday! We are now just 8 weeks away from the 2017 edition of the annual International SAP conference for Utilities. The event takes place in the beautiful city of Lisbon, Portugal this March 28-30. If you book your place before Friday 3rd February you’ll enjoy an early bird saving. This year’s conference is co-located with the International SAP Conference on Oil & Gas. You will be able to take advantage of an unrivalled opportunity to meet and gather cross-industry best practice from senior executives in the wider energy industry. 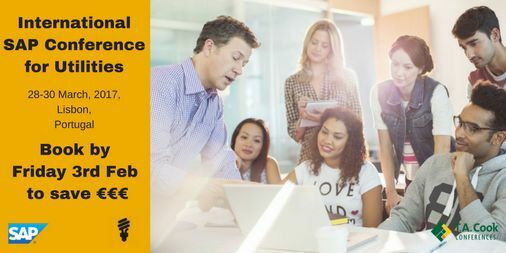 You’ll have some spare time to visit the exhibition hall to meet with SAP and SAP partners who will be demonstrating their world-leading solutions. Gaining expert advice from the providers while trying them out for yourself. The agenda is now complete and can be viewed on the event website. Global SAP Customers including RWE, Contact Energy, Centrica, Enerjisa, OPGC, Jemena, CPFL, Puget Sound Energy, E.ON and more will share their stories this March.